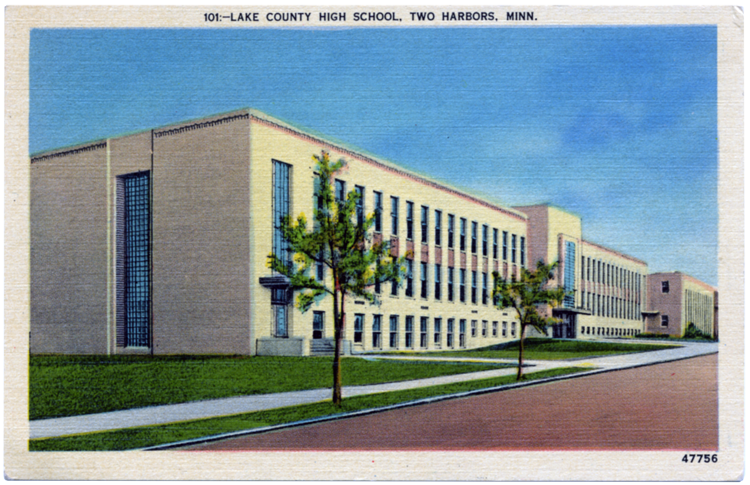 By 1935 the students and faculty had outgrown Two Harbors’ 1901 Central High School building, and plans were announced for a new structure east of the existing structure. Built by the Public Works Administration, the new building was designed in what some call Classical Moderne (or “PWA Moderne” in the U.S.), a subclass of the Art Deco movement. The Art Deco style is demonstrated the school’s buff-colored brick, parapet trim of a decorative zigzag design, and glass block used in the entry tower. Inside the building’s auditorium, Charles Morgan, Leroy Turner, and E. Holm painted murals. The building was estimated to cost about $100,000, but when the last brick was set in 1940, that price had risen to $585,000. The building was constructed in phases, with the first portion completed in 1935. In 1939 a wing was added to the building’s west side. The old high school was demolished that same year, replaced by a new building that brought the two wings together. A small part of the original high school remained: the smokestack and coal bin were retained for the new structures. Later additions added more facilities to the complex, including a gymnasium (1954), a kitchen and swimming pool (1961), and a counselor’s office (1964). In the spring of 2004 the school was closed and the following September the new high school opened in a different location. The 1935 building could no longer be used because of physical and systemic problems beyond reasonable repair. The building was demolished in 2008.